Refer to jscobey's Dan Moto 3D clip-on review thread which I posted on most recently yesterday (link below). Last edited by skokievtr; 07-22-2014 at 07:49 PM. Hard to tell about the bars but that is such a nicely set up cockpit. Looks almost as busy as mine with the vista cruz, gps, etc. Guess its hard to stop customizing. 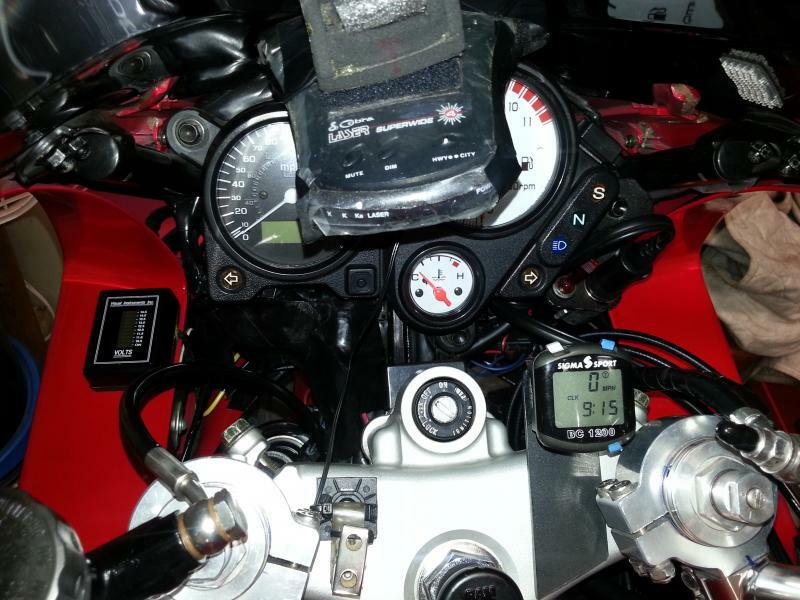 I put a voltmeter after my 1st RR went, 2 thermometers (night and day), hazard lights and then eventually the cbr600 dash. You must have a power outlet in there too right? I appreciate the thought that went into all that stuff. First, the throttle lock is a NEP not Vista Cruise. Second, the cigarette lighter outlet and its on-off switch is attached to a bracket I made that is to the lower right of the tachometer and fastened with the right instrument pod bolt. 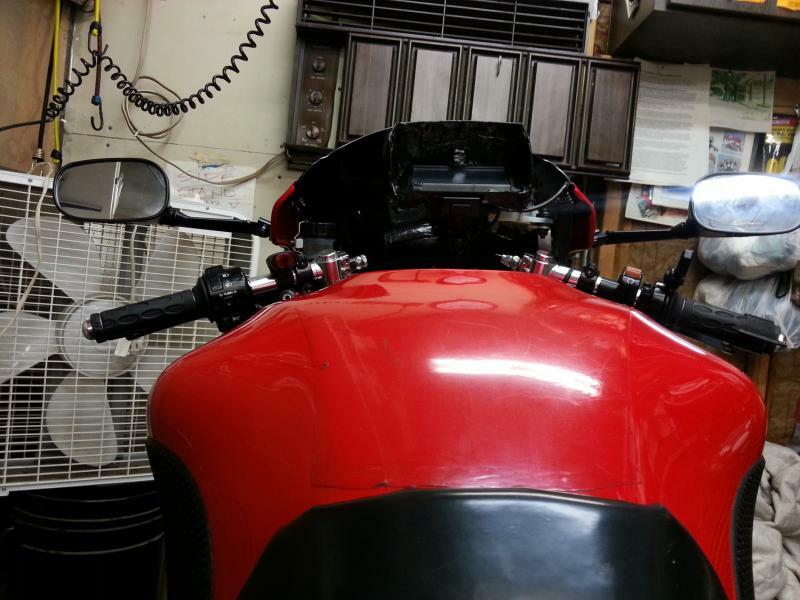 The bar scale LED volt meter is at the front of the top of the left fairing "flat". 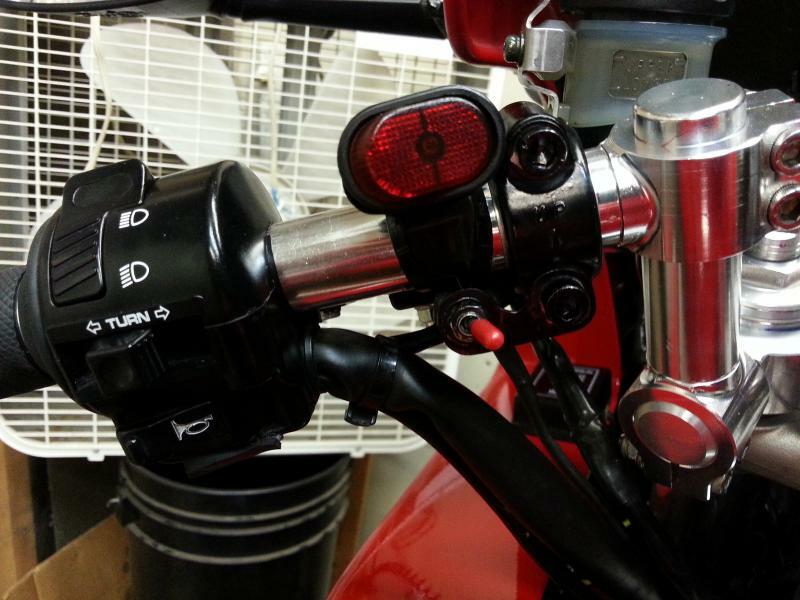 The twin 50w driving light switch and heated grip switch is on the left clip-on. The high beam switch was "adjusted" so it can power the 60/70w low and high beams at the same time in its "1/2" position. A dual 2.1 amp USB waterproof power outlet is below the left side of the saddle next to the Scott Oiler reservoir. Another coaxial jack power outlet extends from under the saddle and can power my heated vest, my custom mini tire air pump, etc, and connects to the Deltran Battery Tender. The jack on the top left of the fuel tank is one end of the extension plugged into the radar/laser detector earphone "out" jack. A high output monaural earphone in my helmets plug into the jack on the tank and its wire is restrained by a clip on the middle of the fuel tank in front of the gas cap. The Sigma BC1200 (bicycle computer) can be seen on the black bracket extending forward from the top triple clamp. The battery direct headlight circuit incorporates a high beam headlight modulator with my own infrared "daylight" sensor circuit. A mosfet VR/R is connected directly to the battery which also has a secondary ground. The original VR/R out positive feed to the main fuse now serves as a power lead to an auxiliary circuit. All added circuits have their own fuse and are fed from a main panel under the saddle. I made my own auxiliary LED brake light license plate, and did the forum tail/brake light unit LED conversion. The front OEM 3-wire TS/RL are at the rear and the front TS/RL are LP 3-wire Type 3 units. The 3rd eye is white LED. My saddle is a Sargent I had them make 1-1/2" taller which then reshaped down and added memory foam on top (it features a patented saddle "Ball Gutter" and "Tush Pan"). The MFW Vario "race" foot pegs are 1" lower and 3/8" back from OEM position; my boot heels are protected from the 2Bros C2 small oval slip-on can pipes by my custom heel guards. The wind screen is a ZG DB. The made an extension for the rear of the front fender and IMO "bobbing" the rear fender is stupid if one ever rides in the rain. 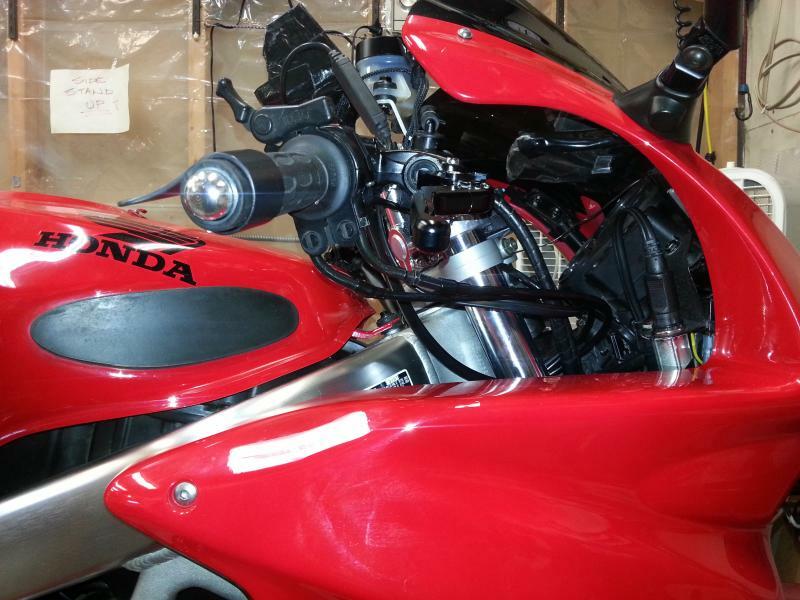 The headlight lens is protected by a Ventura Lexan over-shield. Last edited by skokievtr; 07-22-2014 at 11:03 PM. My bike has mods too.. first I removed graphics from the fairing, on the fairing where superglue oozed out of the left grip and bubbled the paint resides a weatherproof outlet, did I mention no graphics on the fairing? I would love to hear about the mods to the gas tank. Also wondering about the note taped to the wall in picture #5. Where are the cup holders? Seriously, that is a lot of work and done very cleanly. What would you estimate the the change in position the new bars are at relative to stock (up and back)? They look wider, is that the case? In post 2, photo 3, in the upper right hand corner, a square-ish object, what is that? A Scottoiler! I always wanted one of those. I have thought of the headlight modulator but I got some led strobes (white) that are good for a quick flash. I didnt see if you did the front turn signal running light mod. For me in the city that made a huge difference for my frontal profile. Everyone saw me and it doubles the amount of front turn signals since I have leds in the stock spot and leds on the mirrors. First thing I did when I bought my VTR new (90,000 miles ago) and got it home into the Bret Cave was take a hair drier and remove the "Superhawk" decals (because I remember when the original 305 Superhawk came out), did a PAIRectomy and Bafflectomy, and I have not stopped since. Not much to say. To enlarge stock tank, rinse clean of gas, make a circumferential cut with thin carbide wheel about 2-inches down from top, be careful not to break vent and drain tubes at drain doughnut under fill hole or bottom of tank, weld in between and to top and bottom halves a 18 ~ 20 gauge steel "band", grind exterior welds flush, two-coat interior of tank (taking care to not plug upper vent tube) with POR-15, and prime and paint exterior of tank any color you want. BTW, the 5.2 gallon tank is for sale because my old bladder limits MY range. I've had a Handy Industries lift table in the carpeted, air conditioned, heated and extremely well lit and equipped Bret Cave since 1995, and if one attempts to roll off or on a motorcycle from the table in its lowest position with the removable ramp in place (of course) with its side stand down, the consequences can be devastating. Don't ask be how I know this (more than once), especially after completing the latest, greatest modification and being in a hurry to get out on a test run! 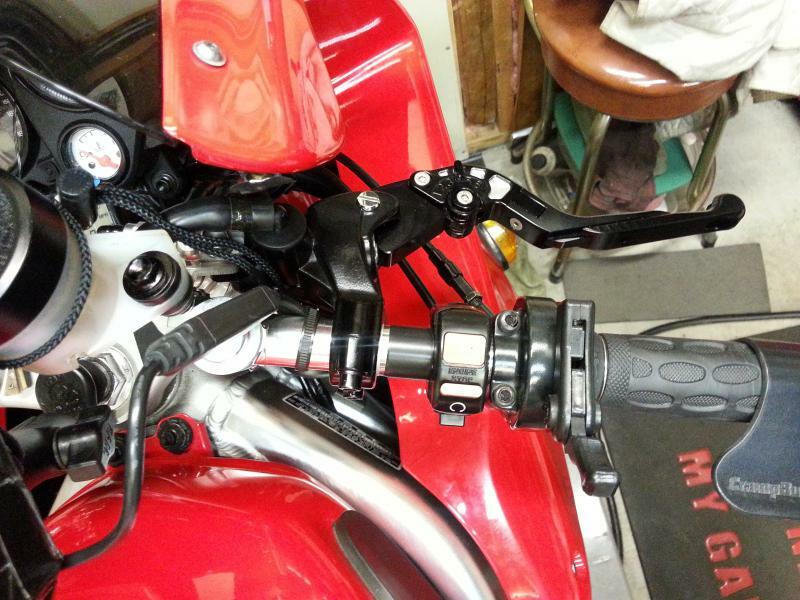 The bar portion of the DanMoto 3D clip-ons is only about 3/8" longer which helps position "up" the bars to locate the clutch and brake perches so the Mad Hornet levers interface better with my size 11.5 and very meaty fingers. 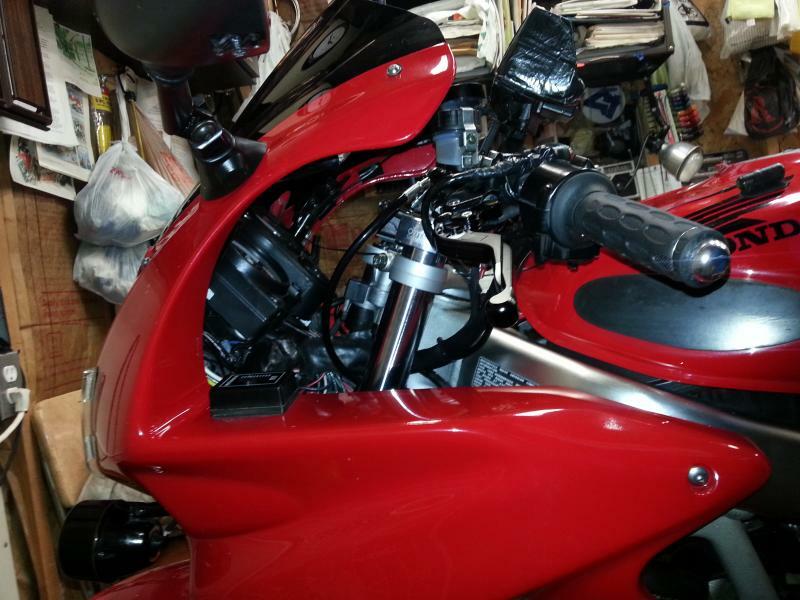 However, due to the design of the DM clip-ons (and similar Tommasellis) the fork tube clamp can be positioned toward the "outside" making the overall "wingspan wider, or inside, top or bottom; i.e., using the left bar as the example, 9 O'clock, 3, 12 or 6) then the "riser" clamp adds 3/4" more. Overall I have them at maximum height, sweep and camber without trimming the fairing "ears" and hitting the tank (though I have restricted steering lock about 5 degrees with set screws threaded into the frame stops). This equates to hand positions about 1.5" higher and more rearward at a natural wrist angle for me. With the 1" lower MFW Vario foot pegs, ZG DB and my self-customized Sargent saddle, the resulting ergonomics enable 600+ mile days even for my relatively old and battered body. I run the 3-wire LP Type 3 incandescent TS/RL in the front which are very conspicuous from the front and sides, and ran a 2nd positive wire to the rear and relocated the OEM 3-wire TS/RL to the rear so as to be more conspicuous to cagers on "my 6". Most OEM rear units are only turn signals, and the thought of being rear-ended is even more frightening to me! I also have auxiliary LED brake light strips above and below the license plate. 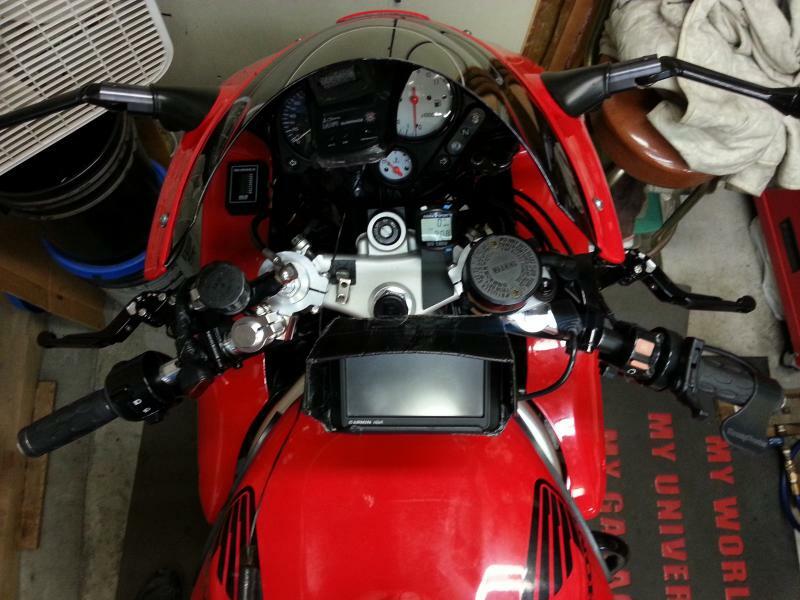 To answer your question, I did the 3rd Eye LED mod but with the headlight modulator going during the day, IMO most cagers would only see that over another set of TS, and at night the one set of TS are VERY bright and appear to be enough (though a 2nd set on the mirrors could not hurt but how do you hide the wires?). 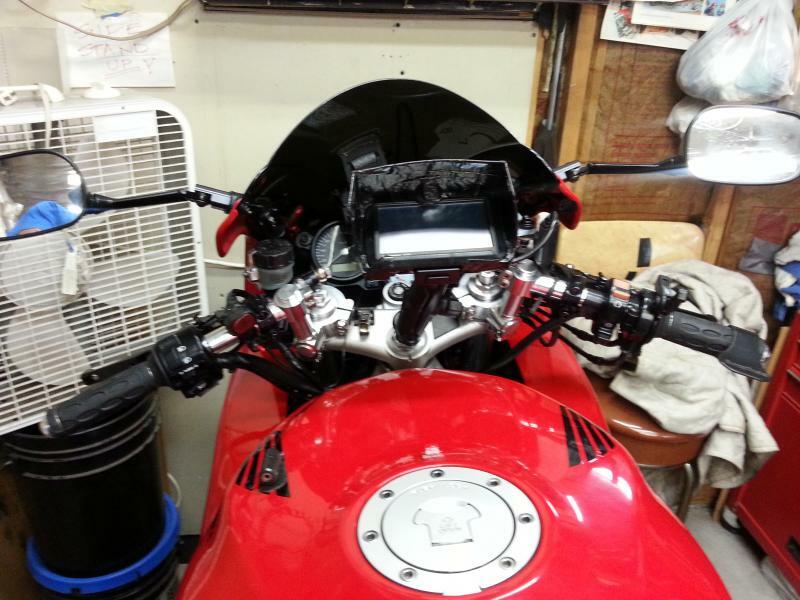 Again LOL, no one noticed the Don Herve mirror extenders or Yamaha R1 mirrors. Last edited by skokievtr; 07-27-2014 at 10:02 AM.